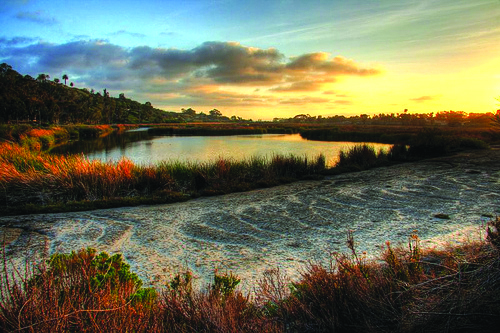 CARLSBAD — A group of residents is putting up a fight against the proposal to turn the Buena Vista Lagoon from freshwater to a saltwater body. The recommendation came from the San Diego Area of Governments in November 2017 after years of study. The project was supported by numerous entities including the City Council and several environmental nonprofits. However, the group Save the Freshwater Buena Vista Lagoon Association is pushing back against the SANDAG findings. Jim Petronella, a Carlsbad resident who lives on Jefferson Street near the lagoon, said the residents have found numerous inconsistencies with the final environmental impact report. SANDAG took over the EIR in 2012 after years of disagreements between the numerous cities and nonprofits. Points of contention for Save the Freshwater Buena Vista Lagoon Association are the addition of an inlet, the pedestrian bridge, loss of habitat and wildlife and less wetlands, Petronella said. The inlet raises concerns of drowning across the proposed 100-foot-wide body of water feeding the lagoon. Petronella said his group is in favor of the freshwater alternative, as it is the best solution. In addition to the freshwater and saltwater options, SANDAG also studied a hybrid and taking no action, the latter of which is an option officials are required to study under the California Environmental Quality Act. Petronella said one reason the lagoon is suffering is due to a lack of maintenance by the California State Fish and Wildlife Service. The body is being overrun with cattails and bulrushes, thus changing the ecosystem. SANDAG’s EIR states a tidal lagoon (saltwater option) would reduce flooding and mosquitos, improve water quality and have the most benefit to endangered species and habitat. Gabriela Torres, a San Diego-based attorney, has been hired by the association and recently sent a demand letter to SANDAG covering the group’s concerns. Torres is focusing on the CEQA and said there are numerous holes in the report. Other concerns include the elevation of the lagoon and how much water from the ocean will run into the lagoon, since the lagoon is several feet above sea level. The change in habitat and ecosystem is another major concern for the group, Torres said. SANDAG will meet Feb. 23 to hear the report and may take action to implement the plan. Del Mar names new chief lifeguardWaterspot: What’s so hot about being warm?